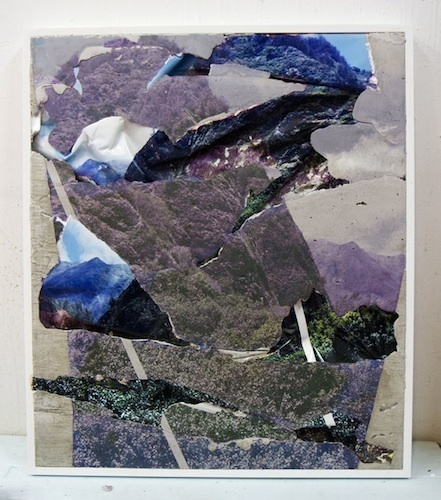 Letha Wilson, Iao Valley Concrete Bend, 2014, C-print, emulsion transfer, concrete, aluminum frame, 28 1/2 x 4 1/2 x 1 1/2". Letha Wilson’s blend of photography and sculpture speaks to the entanglement of human and natural histories as we come to terms with the Anthropocene. In her latest solo exhibition, Wilson offers new composites of the natural and the architectonic, in an array of aleatory techniques that fuse cement and concrete with C-prints as well as with emulsion transfers of abstract phenomena rendered in high-saturation hues. Photographs are not mere images here but can also serve as printing matrix or casting mold. Categorical ambiguity reigns throughout the show, and it’s difficult to find a unified perspective from which to establish a stable subject position in relation to these wall-based works: The “view” is no longer operative for understanding landscape. Figure and ground constantly oscillate, while the works challenge our propensity to privilege either optic or haptic apprehension. Images are literally slashed and punched out as though by a machine, yielding to stone-cold béton brut. Consider Iao Valley Concrete Bend, 2014, which looks like a thin sectional cut from a larger block of igneous flows. The dense agglomeration of pictures depicts fragments of the lush, vertiginous slopes around a Hawaiian valley. Discrete concrete pours break off into swales and crevasses lined by C-prints. Atop the flattened front plane of concrete, another layer of violet-tinted imagery appears, applied directly to the surface through emulsion transfer from a photographic print. Upon close inspection, the two types of printing reproduce the same things, only distinguished by lateral inversion and chromatic differences. Blanched bands striate the surfaces of this and several other works like floating girders. Masked as if in a photogram during darkroom exposure, these elements figure noise in the transmission of images. There’s no untouched Eden to be seen here.